Ancient Egyptians preserved the bodies of their dead through mummification to keep them safe in the afterlife. They were wrapped in linen strips to keep the body perfectly preserved. 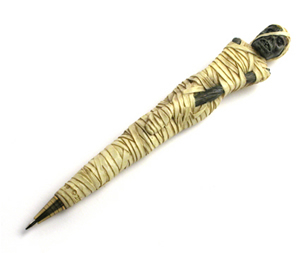 We may not preserve our dead this way anymore, but you can preserve your thoughts on paper with this fun and unique mummy pen. Measures approx 6 inches, made of high quality cold-cast resin and is hand painted. Pen is easily refillable.